EJ-3520-BBX For use with trailers with an A-frame coupler. Easy to operate with the flip of a switch. Durable exterior grade black powder coat finish on outer tube, zinc finish on inner tube. 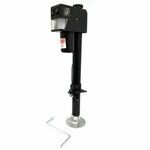 Equipped with a drop leg for 4-3/4" of additional adjustment. Durable hardened steel gears for years of trouble-free operation. Easy to operate rocker switches. 57" power lead wire. Black plastic head. Equipped with L.E.D. light.